The September issue of Growing for Market magazine is out, including my article about growing clovers for cover crops, which I mentioned on my blog last week. I wrote how we had ideal “transplanting weather” (rain) when we needed to top up the transplanted cabbage and broccoli, and then “ideal hoeing weather” (not a cloud in sight) when we started removing the rowcovers and hoeing the rows. We tilled between the last rows in the end, as the grassy weeds got ahead of us (all that rain the week before) and we couldn’t get done with the wheelhoes in time, while the weeds were small. We got “perfect clover broadcasting weather” yesterday (drizzle), and I managed to get the clover mix sowed after lunch. I was in my raincoat, with a bucket of seed under my arm, striding forth. I ended up happy, with lots of mud and clover seed between my toes! It feels good to have that job done. We’re having more drizzle this morning – seems perfect to get the clover seed to germinate there on the surface, without drying out. It’s saving a lot of fussing with overhead irrigation. 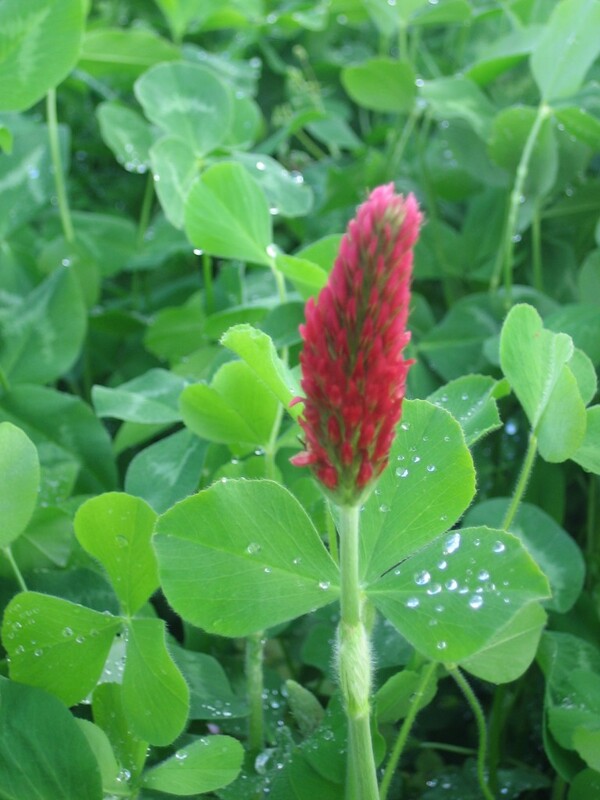 And you can read more about undersowing clovers for all year cover crops (Green Fallow), and other uses of clovers for winter cover crops in Growing for Market magazine. For next month I’m writing about another of our favorite leguminous winter cover crops, Austrian winter peas. 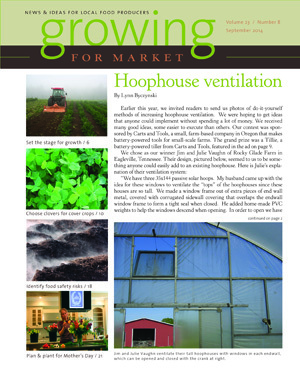 The September issue also has an article generated by a competition among readers to send in ideas for easy DIY hoophouse ventilation. Ideas include high end wall windows (Tennessee), sidewalls rolled up onto pipe hangers (Louisiana), internal end-wall sliding doors (Alaska) and roll-up ridge vents (North Carolina). Chris Blanchard writes about increasing production efficiencies and scaling up for increased production. He wisely recommends first taking a cool calm review of how your current plans have been working, and which bits haven’t been working. Don’t expand unless you have a successful grasp of what you are already doing. If you are unsure, focus first on improvements, then revisit the idea of expansion. Get better before getting bigger. Chris has a lot of wise advice and this is a good time of year to review and plan for next season. he recommends keeping a file folder labeled “Painful Things to Remember in November”. You drop a note in the folder whenever you hit a problem during the year, so that in the winter you can be reminded (helpfully!) and you can devise solutions or changes before next year. I like this. I try to do some of this, but a dedicated folder, or maybe a box, like a Suggestions Box, in the shed, for any of the crew to drop in a note. . . 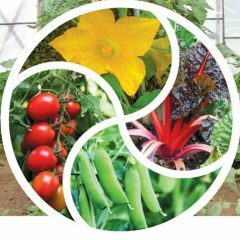 There is an article on the food safety risks introduced by irrigation water and by compost, written by Meredith Melendez and Wesley Kline from Rutgers NJAES Co-operative Extension Service. We all need to be reminded to take appropriate care to make sure our food really is as healthy and good for us as we want it to be. Gretel Adams writes about preparing for Mothers’ Day flowers – yes, now is the time to plant for that event, one of the biggest in the flower farmers’ calendar. And then – the pickleworm has arrived in our part of Virginia. This tropical insect, Diaphania nitidalis overwinters in south Florida (and maybe south Texas) and spreads up the east coast each year. It regularly reaches South and North Carolina in August or September. It reached here in the first week of September. This is the first time I’ve seen this pest on our farm. I’ve read that it can reach as far north as Michigan and Connecticut some years. We’re reassured that it can’t overwinter here, and that we could get at most 3 generations. Sort of reassured. The adult is a night-flying moth, which lays tiny eggs on buds and flowers. 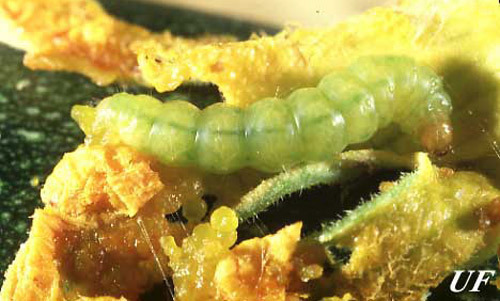 Despite the name, this pest likes yellow squash more than pickling cucumbers. (And winter squash, gherkin and cantaloupe can be colonized if necessary. 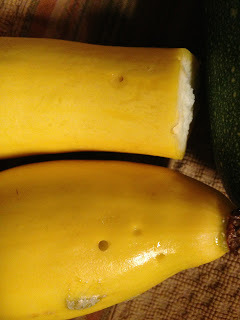 )We first found ours on Zephyr yellow squash and initially the neighboring Noche zucchini was untouched. But yesterday some of the zucchini also had holes. Yes, I’m getting to that. When the eggs hatch, the small multi-spotted white, brown-headed larvae/caterpillars burrow into a squash, where they eat and grow, and do what everyone does, poop. If you don’t act quickly, the inside of the squash gets tunneled out, until the fifth instar, up to an inch long, is ready to pupate. The fifth instars are the easiest to find, being biggest, although they have lost their spots and are now colored according to what they’ve been eating, somewhere in the pale yellow-green part of the spectrum. The dark copper-colored pupae (haven’t seen those yet) nest in a leaf fold or among dead plant mater, for 8-9 days, then a new adult moth emerges. What’s a busy organic (small o) farmer to do? Soldier beetles and some carabid beetles eat them. Steinerama carpocapsae nematodes attack them. We’d have to buy those in. Bacillus thuringiensis (Bt) would kill them if we could reach them, but they are living a sheltered life inside our squash! We could cover the plants every night and uncover them every morning to let polllinators in, but oh dear, the days are so full already! We decided for this week, we’ll just harvest the squash a bit smaller than usual and see how that goes. Maybe not many moths arrived, and frequent harvesting (and slicing up of holed squash) will stop any future generations. Slicing the squash at the level of the hole does usually decapitate the larva. I wonder how long the moths live for? The eXtension website publication Biology and Management of Pickleworm and Melonworm in Organic Curcurbit Production Systems by Geoff Zehnder of Clemson U provides the useful information that “research by Brett et al. (1961) demonstrated marked resistance to pickleworm in the following varieties: Butternut 23, Summer Crookneck, Early Prolific Straightneck, and Early Yellow Summer Crookneck. The varieties more susceptible to pickleworm are Cozini Zucchini, Black Caserta Zucchini, and Benning’s Green Tint Scallop squash.” I might add Zephyr squash. Spinosad might be effective, but as with Bt, I think it would be difficult to get the spray on the beasties as they are inside the squash. For pictures of the damage, see Sunninglow Farms blog. They are in Florida and posted this in April. I shouldn’t complain too loudly. It is September here. Pickleworm damage to yellow squash. Now I must get on with finishing preparing my powerpoints for Heritage Harvest Festival and Mother Earth News Fair in Pennsylvania. Hope to see some of you there!